he app, called Swift Playgrounds, is available free this Fall for IPad and other apple devices and you won’t be surprised to learn that the coding language taught with this app works best with Apple products. There’s no denying that coding is a large part of all of our daily lives. From our phones, to our computers, and the apps that we all enjoy everyday, coding has a secure place in 21st century technology. Even just a few short years ago, coding was really not a topic in the broader conversation involving education and technology. Today, there is little technology for the mainstream that doesn’t rely on coding in some way and schools are readily introducing coding into their curricula. Essentially, coding is becoming a universal language by which we can all communicate and we all know children are quick to learn a new language. If you still have questions about coding, you can find out more by clicking here. Apple is by no means the first to encourage kids to code. There are a number of apps on the market today that aim to get kids coding. Check out Commonsense.org and apps like ScratchJr. Tynker.com, Hopscotch and Daisy the Dinosaur. The Meccano Meccanoid G15 Personal Robot Building Set is a great way to learn code and CodeMonkey can get anyone started. No longer is coding limited to the so-called computer science geek sitting alone at a computer. Coding is hip, coding is cool and coding is a skill our children are going to need to compete in the future job market. Children are naturals when it comes to coding because they have no pre-conceived notions regarding coding, what it is, or how it’s done. To them, it is not a strange and highly scientific endeavour left to the scientists among us. It is a way to play games, learn about computers and make friends. What child wouldn’t want be a part of that? Schools have already been ahead of the curve on this one; introducing coding to students as young as four and five. It only makes sense that Apple would then create an app to teach those very kids a coding language all its own. The app, called Swift Playgrounds, is available free this Fall for IPad and other apple devices and you won’t be surprised to learn that the coding language taught with this app works best with Apple products. 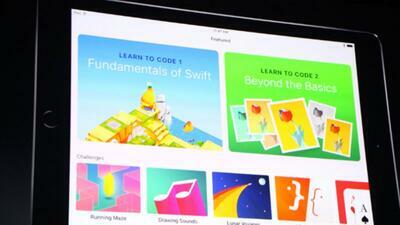 Like any of Apple’s endeavors, Swift Playgrounds promises to be big. You might want to mark you calendars for Fall so you can make sure your kids get an early start.